Is there any way back for Arsenal against Bayern Munich? As the Gunners attempt to overturn a four-goal deficit in the Champions League, what does history and current form say about their chances? That is the generally accepted wisdom ahead of the second leg of their Champions League last-16 tie against Bayern Munich, and it is backed up not only by a glance at the current state of the Gunners compared to their German opponents but also by a look at the history books. No team has ever recovered from a four-goal first-leg loss in the history of the competition in its modern form, with only nine teams ever coming back from so many as two goals behind at the halfway stage. There is, however, a glimmer of hope - one team has won 4-0 in the second leg to go through, which is one of the scorelines that would seal Arsenal's progress following their 5-1 defeat in Munich, and there is an intriguing link in that tie to their opponents on Tuesday. Arsene Wenger may be showing his players the DVD of Deportivo La Coruna's famous win over AC Milan this week. Not only did the Spanish club overcome a 4-1 deficit in the 2003-04 quarter-finals by scoring four of their own in the return fixture, they did it against the man standing in the Gunners' way now - Carlo Ancelotti. 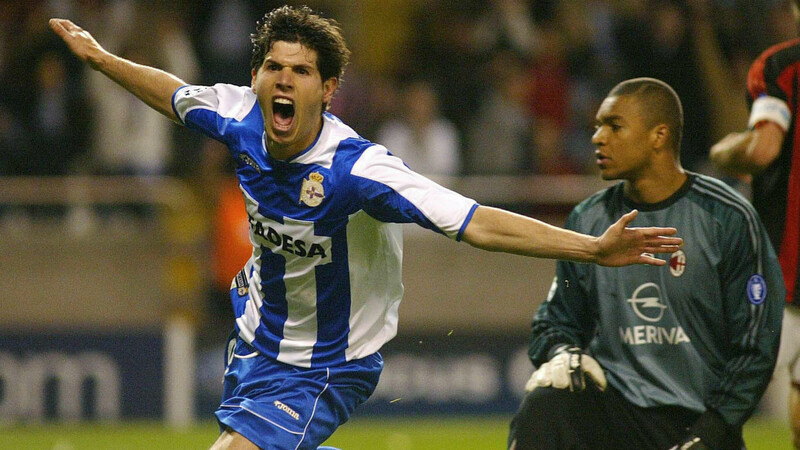 Like Arsenal, Depor netted what seemed to be a worthless away goal - through Walter Pandiani - at San Siro as they fell to a heavy defeat. But they roared back in sensational style on home turf and were in the lead on aggregate by half-time thanks to goals from Pandiani, Juan Carlos Valeron and Albert Luque, with the one they had netted on the road proving vital. Fran Gonzalez added a fourth and, his prayers having been answered, Deportivo manager Javier Irureta vowed to take the Camino de Santiago pilgrimage after having his show of faith rewarded. As glittering as Ancelotti's history in European competition is, it is not the only time he has suffered from a shocking reversal in fortunes. Perhaps even more famously, of course, he had one hand on the Champions League trophy the following year only for his side to blow a three-goal lead in the second half of their final against Liverpool before losing on penalties. "I want to forget but I'm not able to forget," Ancelotti said this week of the two comebacks. "This is the beauty of football, because in football you never know and I think that experience was good for me to avoid this kind of problem [again]." Arsenal have faced German opposition 17 times in the past 10 seasons in the Champions League as a result of the fact they have repeatedly being drawn against Bayern and Borussia Dortmund, as well as Schalke and Hamburg. They have split those matches right down the middle, winning seven, losing seven and drawing three. That does not sound like a disastrous record on the face of it, but three of their wins were in the three least-recent matches - two of which came in the group stage against Hamburg - so it is not exactly one which has been on the up of late. Seven of those games have come against Bayern and Arsenal have won just two - a 2-0 victory at the Emirates Stadium in last season's group stage and the 2-0 win in Munich in the 2011-12 last 16 that gave the Bavarians a scare after their 3-1 first-leg triumph in north London. If we were being ultra critical of Arsenal we might note that neither of those victories has had any effect on Bayern - they still won the group last year and progressed out of that 2011-12 tie - but in fairness, the more recent of the two wins was vital in seeing them through to the knockout stage. This is where it gets especially worrying for Arsenal fans. The Gunners have been in miserable form in recent weeks, winning just two of their past six games in all competitions - against lowly Hull City in the Premier League and minnows Sutton United in the FA Cup. Losses to Liverpool, Chelsea and Watford have dented their hopes of finishing in the top four of the Premier League and piled pressure on Arsene Wenger, and then, of course, there was the 5-1 embarrassment in the first leg of this tie. Bayern, on the other hand, are gathering steam at just the right time - as Ancelotti's teams tend to. They have won five of their six games coming into the second leg, scoring 22 goals and conceding just two in that run. The draw at Hertha is the only blip, with Ancelotti's decision to rest Robert Lewandowski looking like backfiring until the Polish striker came off the bench to grab a last-minute equaliser. They have rolled over everyone they have faced since then, however, and Arsenal's only hope might be the chance that those simple victories have given the German champions a false sense of security going into their clash at the Emirates.